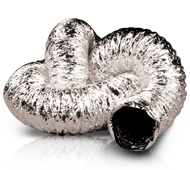 Non-Insulated Flexible Duct is used to facilitate the movement of air. It is available in a range of diameter to fit a number of fan sizes. It is built to exceed the requirements of AS4254.